While many of us may have already celebrated a new year according to the Gregorian calendar, February 5, 2019, marks the start of the Chinese New Year, with the upcoming festivities ringing in the Year of the Pig. Although the pig is not a popular animal in some parts of the world, in the Chinese Zodiac, pigs are associated with wealth and good fortune. Therefore, it’s fitting that some top luxury watch brands have announced special edition, ‘Year of the Pig’ watches just ahead of the lunar new year. Let’s have a closer look at what they are! 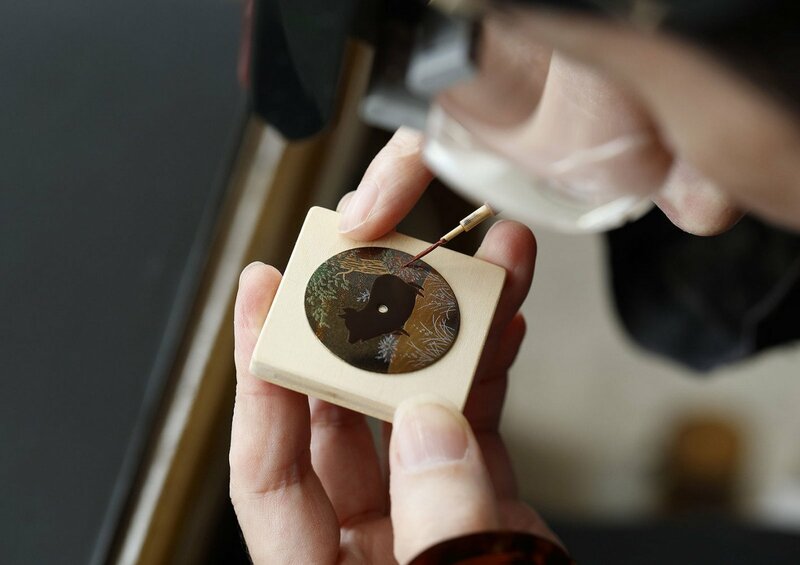 Creating the lacquer dial of the Chopard L.U.C XP Urushi Year of the Pig (Image: Chopard). Available in either platinum or rose gold, production of the ‘Year of the Pig’ will be limited to just 12 examples each (Image: Vacheron Constantin). The ‘Year of the Pig’ watch will join Vacheron Constantin’s Métiers D’Art The Legend of the Chinese Zodiac collection – which already includes ‘Year of the Rooster’ and ‘Year of the Dog’ models. 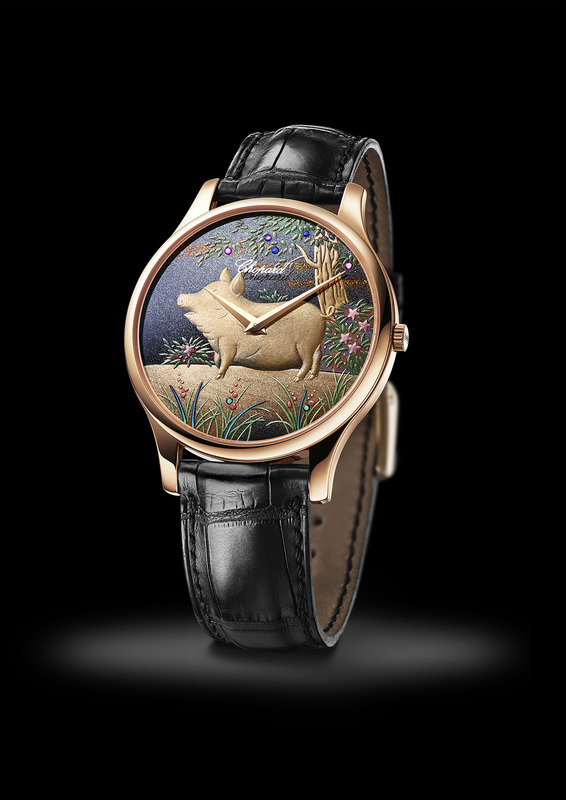 As part of their Métiers D’Art (artistic crafts) line, the Vacheron Constantin Year of the Pig watch showcases intricate decorative techniques such as engraving and enameling. 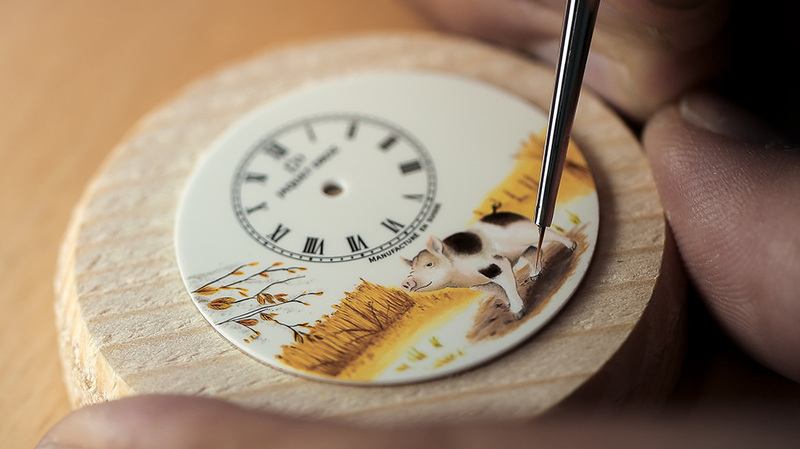 At the heart of the dial is a hand-engraved pig that boasts incredible life-like detail. The animal is applied to a foliage-decorated enamel dial, and flanked by four apertures on the periphery. Abandoning the need for hands, the quartet of windows displays the hours, minutes, day, and date, which are all powered by the automatic Caliber 2460 G4 movement that sits inside. To maximize the view of the dial, the ‘Year of the Pig’ features a movement that does not use traditional hands (Image: Vacheron Constantin). 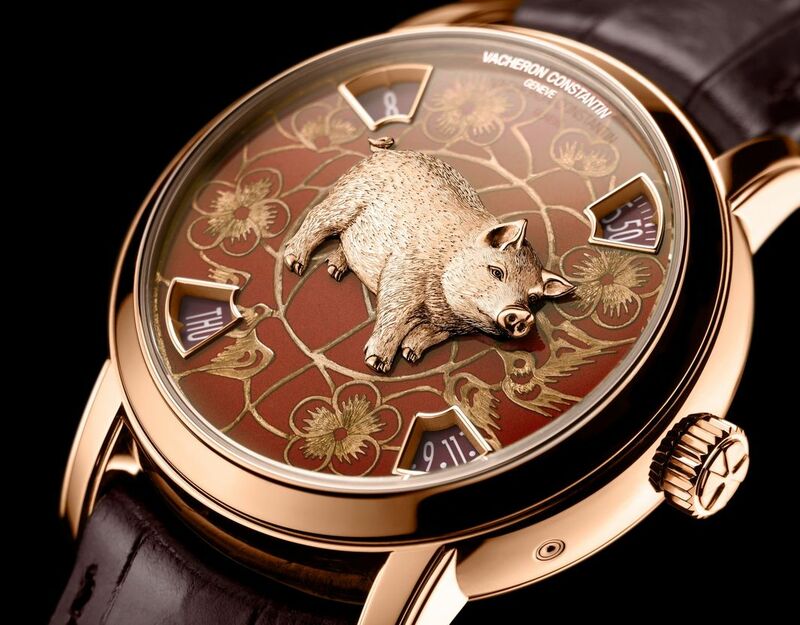 Vacheron Constantin will make The Legend of the Chinese Zodiac Year of the Pig in two different versions (platinum and rose gold), and each model will be limited to only 12 pieces worldwide. 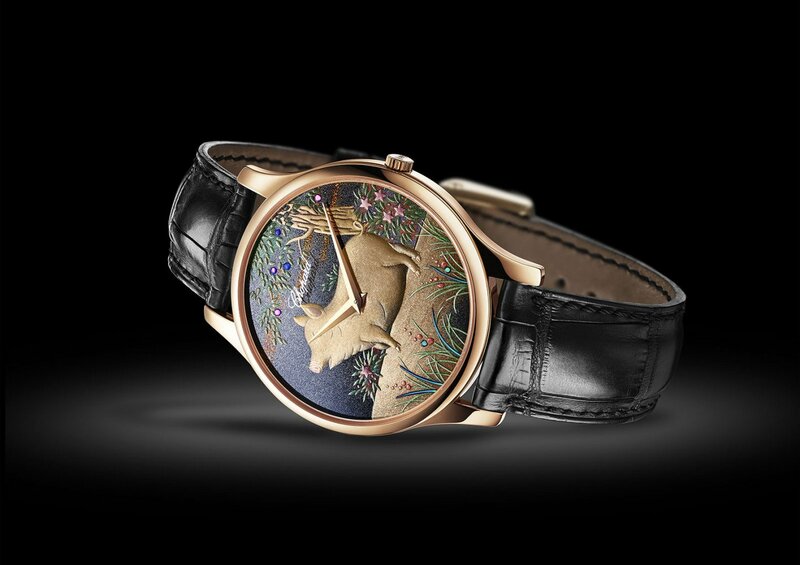 Production of the Chopard L.U.C XP Urushi Year of the Pig will be limited to 88 pieces (Image: Chopard). Chopard is another luxury watch brand that adds a Year of the Pig watch to their Chinese Zodiac collection. The Chopard L.U.C XP Urushi Year of the Pig sports a 39.5mm rose gold case, and will be a limited-edition of just 88 pieces. The highlight of this Chopard watch is its dial, which depicts a golden pig (a symbol of abundance) wandering through a forest, which is made using a beautiful Japanese lacquer technique called Urushi. This ancestral craft requires the hands of a master and relies on the sap of the Urushi tree, which is harvested only once a year, and in very small quantities. The Chopard L.U.C XP Urushi Year of the Pig features a dial that is finished with the a traditional Japanese lacquer technique called Urushi (Image: Chopard). To not overshadow the miniature portrait, the dial only includes a pair of hour and minute hands (no seconds hand or date window), which are powered by Chopard’s ultra-thin Caliber 96.17-L automatic movement. The Jaquet Droz Petite Heure Minute Relief Pig features highly detailed engravings on its dial and movement (Image: Jaquet Droz). 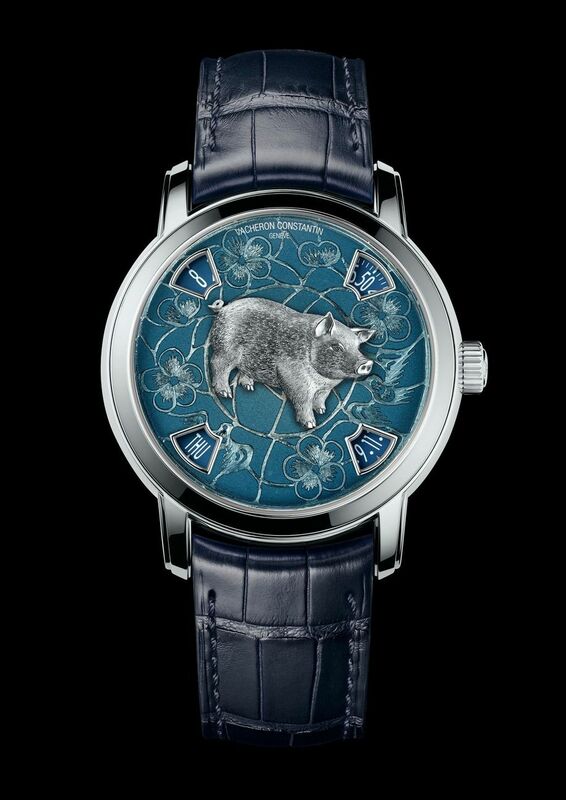 To honor the 12th animal in the Chinese Zodiac cycle, Jaquet Droz released not one, but four – ‘Year of the Pig’ watches. The first set includes two Jaquet Droz Petite Heure Minute Pig models in red gold. Limited to 28 pieces each, the men’s version features a 39mm case, while the ladies’ model includes a 35mm case set with diamonds. 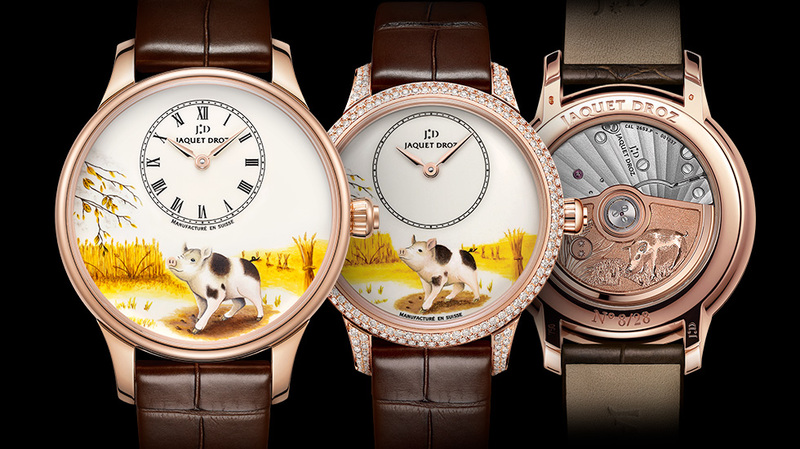 The dials of the Jaquet Droz Petite Heure Minute watches are painted to portray a young pig in a field of ripe wheat, which signifies abundance and prosperity. The back of the watch has a similar scene engraved into the movement’s oscillation weight. The Jaquet Droz Petite Heure Minute Pig models are available with either 39mm or 35mm red gold cases (Image: Jaquet Droz). The second set is the Jaquet Droz Petite Heure Minute Relief Pig, where engraving is the art form used to decorate the dial and movement. 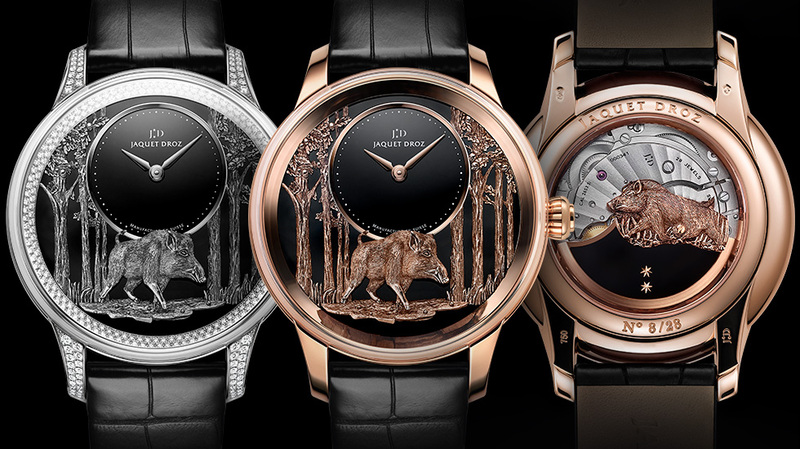 Also heavy on symbolism, the 43mm watches illustrate a wild pig among eight oak trees. Eight is considered a lucky number in Chinese culture, while the oak tree represents power and longevity. The first model in red gold is limited to 28 pieces, while the white gold and diamond model will be limited to just 8 examples. The dials of the Jaquet Droz Petite Heure Minute Pig feature miniature paintings of a pig in field of wheat (Image: Jaquet Droz).